RBC Capital Markets expressed belief on Tuesday that Apple will revamp its MacBook portables later this quarter and release a new iPhone in September or October. In a note to investors, analyst Amit Daryanani issued predictions that largely echoed prevailing expectations for Apple's near-term plans. Both the suggested June release of new MacBooks and the fall launch of the iPhone fit with reports from other analysts and news outlets. The investment bank reiterated its Outperform rating and a $700 price target for shares of Apple. The firm believes the Cupertino, Calif., company stock could hit $700 within the next 6-12 months, citing new MacBooks, an upcoming iPhone and a potential "iTV" connected television as catalysts. He also pointed to projected sustained momentum for sales of the new iPad through the "June quarter and beyond" as another factor that will support Apple's growth. Daryanani highlighted the iPhone as the company's "flagship product" and noted that sales of the device represented 43 percent of Apple's revenue in fiscal 2011. The high margins that the company enjoys with the iPhone should prop up its gross margins if the smartphone continues to grow market share. RBC cautioned that Apple's apparent two-year design cycle could cause "increased seasonality" as consumers catch on to it and hold off on purchases. For instance, the company saw just 21 percent growth in iPhone shipments year over year in the fourth quarter of 2011, compared to 91 percent growth in Q4 2010. "In our view, a redesigned version of the iPhone every two years will likely result in higher unit sales relative to the iPhone S versions as carrier contracts last roughly 2 years and consumers have historically been attracted to the new design concepts created by Apple," he wrote. The analyst believes the next-generation iPhone will come equipped with "the latest 4G/LTE technology" that will likely be paired with redesigned look. He expects Apple to make the device available during the "late summer/early fall time frame." 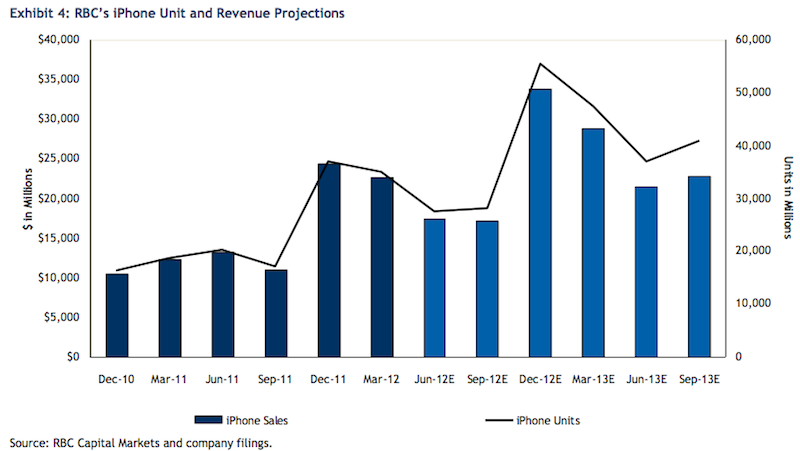 Last year, RBC analyst Mike Abramsky narrowly misjudged the iPhone 4S release. He told investors last August that Apple was likely to release its new iPhone in the September quarter, rather than in October as other reports had suggested. Ahead of a new iPhone, RBC expects a MacBook Pro update to arrive as early as next month. The analyst also mentioned the likelihood of an "updated version" of the MacBook Air in the next 6 months. Apple is believed to have been waiting for Intel to ramp up its new generation of Ivy Bridge processors before releasing new MacBook Pros. The last major revision to the product line came in February 2011, though the notebooks did get a modest speed boost last October. Of the company's Mac offerings, RBC is "most impressed" by Apple's MacBook Air line, Daryanani noted. The firm believes the entire Mac lineup will grow 10-15 percent on an annual basis, though it expects portables to continue to outsell their desktop counterparts. His current projections for fiscal 20123 are 24.2 million Mac units, comprised of 5.4 million desktops and 13.9 million portables. As for a possible Apple television, the analyst said that such a device would make "strategic sense" for the company as it could help increase the "stickiness" of other Apple products. Standout features that the firm expects the "iTV" to have include Siri voice control, a multi-function remote, Retina Display, FaceTime and "seamless syncing" with other services and products. Samsung, LG and Sony would represent the main incumbents that Apple would compete against in the television market, according to the analyst. He did, however, express concern that adding a TV to its product lineup might "act as a drag" on Apple's margins. The firm believes Apple's margins for a connected TV could be as low as 15 percent. Modeling for the first 12 months after release of the rumored television, RBC expects Apple will sell 10 million units over the period, amounting to an estimated $15 billion in revenue and $1.77 in earnings per share.